We built a hot tub deck recently and it turned out quite nicely. Like any good construction project, before we got started we needed a set of deck bench plans. The mountain laurel newel posts stick up above the handrails for a completely different look. Nestled in a woodsy spot, the posts and balusters also blend beautifully with the background. As you’ll see in the following pictures, natural elements bring to life our concept of an incredibly functional deck. A deck is a great touch for the home as well as a way for the family to spend quality time together. It is respectable enough for the grownups to feel relaxed in, and at the same time cool enough for kids to hang out on, while pretending it’s a tree house. A deck is also a lovely retreat when you want to be alone with your thoughts, not to mention that it is a knock out idea for your home improvement additions. Decks automatically call out to you, encouraging time spent as a group while getting the benefits of fresh air and other out of doors advantages. It can also do a lot for the aesthetics of a house or property, as well increase the value of the home. Building a deck can be borne out of many reasons including decorative and home improvement objectives, recreational and leisure concerns, and even for health and wellness causes. Irrespective of the causes which bring about their construction, Decks are quite popular home décor choices, and for excellent reasons. At Mountain Laurel Handrail, we have been doing outdoor and indoor home improvements for more than a decade now, and though the majority of our work consists of (hand) railings for various uses and in different applications, we do dabble, from time to time, in non-rail projects, such as our line of unique Laurel furniture, for instance. This project provided another opportunity to step out of our comfort zone a little, and explore our passions in another direction. The project here was unique, in that part of it was something we had done lots of time previously, and at the same time, the other substantial part presented new and exciting creative challenges. This project was the recent building of a hot tub deck, with extra seating space, in an outdoor location; and it turned out really well, if I may say so. Every fresh job, as a matter of course, comes with its own particular requirements, and it was quite interesting trying to predict the direction(s) the hot tub deck would lead us in. 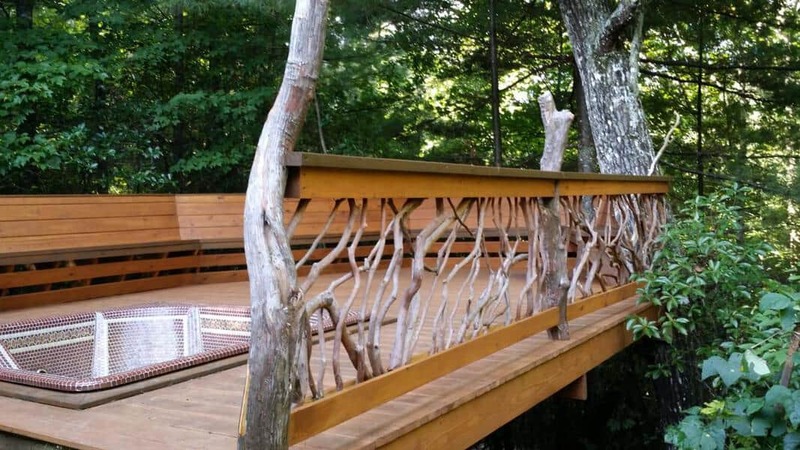 Naturally, the homeowner also had certain defined thoughts and concepts about the way she wanted the final deck to look. It was necessary to look at all these in the light of practical design and construction parameters, and determine quickly what would work, and what would need some modification. The environment itself, which was a woody, naturalistic terrain presented the challenge of requiring that we came up with something creative in design that was not at odds with its inherent character. Rather, the best chosen design would instead utilize the environment’s strengths in a non-evasive manner, in order to arrive at a unified and complementary whole. Nature has her own peculiarities and demands, and it is often arduous to force or shape it into a structured architectural form without resorting to expensive and time consuming alterations. In this case, the latter were not an option. So, as I said, we were excited to see where this would lead. Like any good construction project, before we got into it properly, the first thing we needed to do was brainstorm-up ideas for a strategy that included a set of workable deck bench plans, adequate railings designs, and also a competent integration of a hot tub. The planning stage is always unpredictable, because you just never know what you are going to end up with when the team’s creative juices kick in. 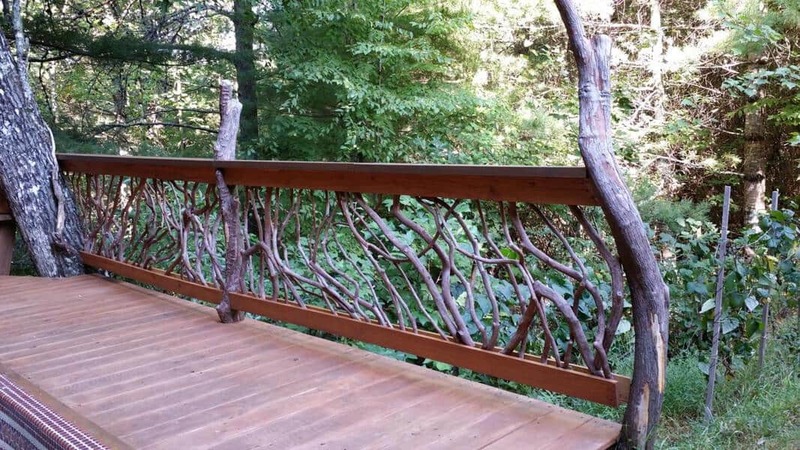 In addition to the usual task requirements in building a deck, we would need to incorporate an awesome railing feature that would blend in with the rest of the complete design. Finally, everything had to fit within the natural landscape the deck was to be situated in. As it is, we ended up with something quite remarkable in a quiet, understated style. I am particularly satisfied with the finished work due to the fact that it fulfills all the many project requirements, and still goes on to be an artistic and functional success. Some of these obligations include meeting the homeowner’s expectations and desires, making use of the surroundings in a subtle and natural way, and of course ascertaining that the basics of deck design and construction were met and perhaps even surpassed. Work like this, of course, just doesn’t happen, but is brought about by a convergence of skill, experience, planning and a budget put to work in the right, creative way. There will always be conflicting interests, factors and elements, and the main task in a project such as this is actually finding something for each part to do without jeopardizing the unity of the design as a whole entity. When you have a completed project that looks as natural as the environment it sits in, then you can let out that quiet breath of relief and contentment. As you’ll see in the following images, by blending our design with the natural environment in which the deck is located, we have created a soothing blend of the man-made and the natural, resulting in a most pleasing fusion of the individual parts. The natural elements present truly bring to life our concept of an incredibly functional and yet decorative deck. Looking at the images, you may observe that the mountain laurel newel posts extend above the handrails for a completely different look as far as deck architecture is concerned. This faintly maverick touch, amidst the order of the straight-lined railing and bench, is deliberate and calculated for just the effect it conjures. Nestled in a woodsy spot, surrounded by forest green, the posts and balusters nonetheless also blend beautifully with the natural background. Indeed they serve as a counter-point to the foliage, actually bringing attention to it by contrasting subtly with it. 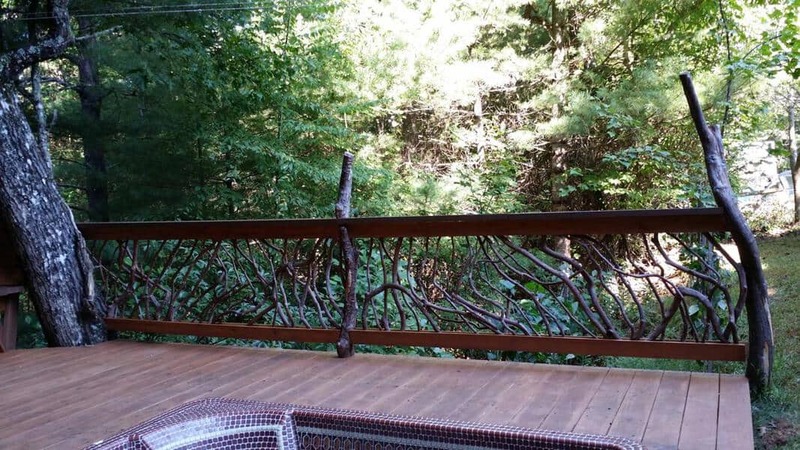 As another unique feature, we incorporated a mature tree directly into the deck and railing design. This addition nonetheless works because it fits into the overall template of the great outdoors, and matches the main design scheme in color and form. The challenge in this type of design is finding the precise corner to place the natural element. At the same time, it must be powerful enough design-wise to make a real difference without necessarily overwhelming the rest of the design components. By doing so, we took advantage of the property’s natural beauty to craft more than just an outdoor living space. We in effect created a new ecosystem that blends man and nature, old and new, and the indoor with the outdoors. The result is a tranquil and relaxing backyard naturescape. This is an almost perfect design for deck bench DIY. The only thing I would do differently is to leave some space between the bottom board under the bench. That way it isn’t hard down on the deck, but instead has some space to blow leaves under. Seamlessly integrating the hot tub deck into its nature-heavy surroundings is only a part of the beauty of the entire design. The plan also includes some incredibly functional elements. A long, built-in deck bench railing conveniently adds extra seating capacity. This particularly comes in handy when entertaining family and friends. Constructed with a deliberate slight angle, the bench features an ergonomic design crafted for comfort. It also serves as a protective railing for children especially, thereby serving multiple functions. 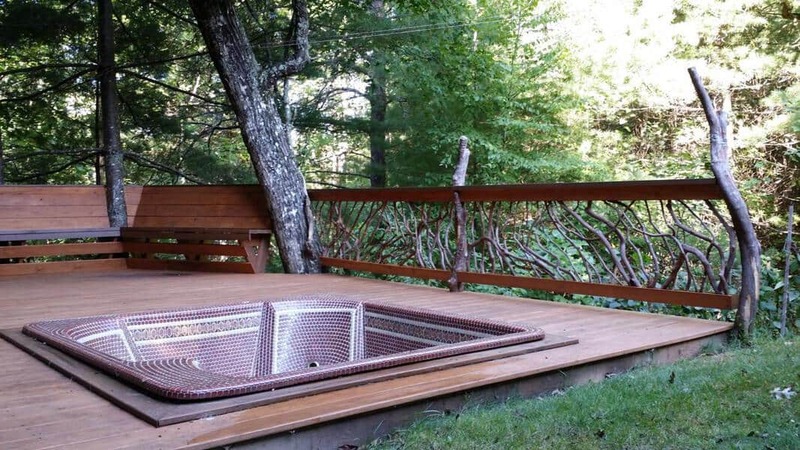 We built this hot tub deck around a very fine, 7′ square hot tub finished with 1″ tiles. It’s a beautiful tub and the homeowner wanted a nice outdoor space for relaxing around the tub, and at the same time, enjoy the mountain scenery beyond. It could also double for a location for entertaining guests, especially on hot days, or perhaps hosting a party for a small number of guests. To achieve this, she needed integrated deck railing seating. There was an initial hitch in trying to find exactly the right design element or option, which would not be obtrusive, but would meet the seating requirements while blending with the environment. 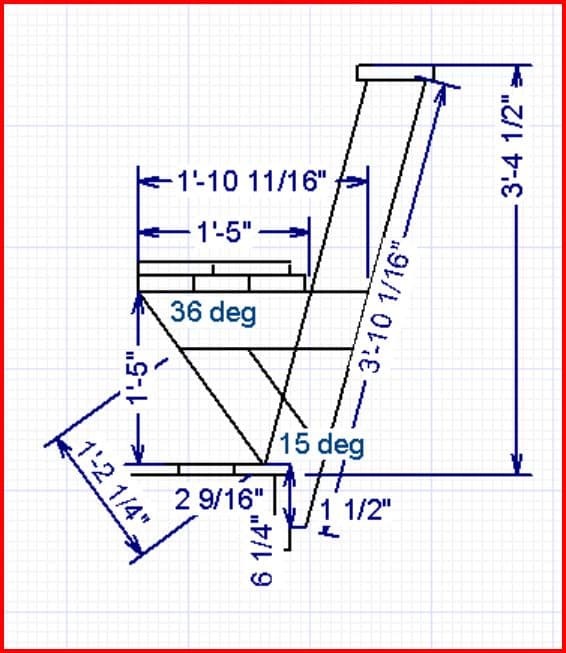 Having done some research online, I was unable to find good deck bench plans with dimensions that I wanted, as well as with details on how to build a bench deck railing. I was also quite unsatisfied with other built-in deck railing bench designs that I saw. The best option appeared then to be to draw up a fresh set of plans that would uniquely fit all the requirements for the project. So, being proficient in CAD, I decided I would draw up a bench deck railing seating plan using CAD… and here it is! CAD again proved to be an incredible tool, giving me just the right mix of creativity and technical function to meet the project needs. This is an almost perfect design for a deck bench going the DIY route. It is functional, meets the homeowner’s special needs, and at the same time allows the surrounding element space to express itself. The only thing I would do differently is to create some space between the bottom boards under the bench. That way it isn’t hard down on the deck, but instead has some space to blow leaves under. This allows cleaning of the deck to be done much easier and quicker. While sitting on the left side of the hot tub one can enjoy a soothing view of the landscape, which is the whole point of this outdoor hot tub design. Instead of blocking the scenery, the meandering branch balusters allow for some gaps through which the scenery can be appreciated. And better yet, they complement the background. The intricate design in the balusters are reminiscent of a natural forest or wood environment, and cleverly evoke the hap-hazard look of nature. The result is a design that refuses to call undue attention to itself, while at the same time lending itself subtly to the entire deck design. The Mountain Laurel handrail is strong and secure, functioning as a safety feature along the right perimeter of the raised deck. The rail provides a quaint charm that is aesthetically pleasing and practically functional. It is possible to at first mistake it for a natural part of the environment instead of an artificial element. This seamless bonding is the essence of the both the deck plan design, and in fact the whole project. The bench backing, which provide low walls around the deck and the tub to the right side and at the far end are deliberately designed to also provide an unimpeded view of the environment, while providing some protection and a boundary. The bench itself provides extra seating for guests in an open and comfortable manner, allowing perfect views of the landscape in front. Made of good wood stock and very durable, it can seat a commendable number of guests in a comfortable, non-squeeze manner. Mountain Laurel’s newel posts are a design feature that work exceptionally well in giving the overall design a most unique touch. They are deliberately chosen to lend a rustic, country-side touch in an antique style perfect for the application it was put to in this design. The posts are quite durable, and will reasonably withstand the natural wear and tear occasioned by weather and other climatic conditions. The twisted look is in counterpoint to the otherwise straight lines of the railing, the bench and even the square tub. It gives it an enlivening touch and adds a bit of a twisted-oak quality to the deck. It is also certain to be a great conversation piece. The whole deck has a solid foundation in the hard wood flooring boards, which give a firm underpinning to the design. This flooring is color coordinated with the rest of the deck, and also serve as a general base for the other features of the deck. The flooring is made of solid boards that are sturdy, hard-wearing and great for outdoor application. This flooring will take anything, from the patter of little feet of a kid party to the heavier treads of a grown up cocktail hour. 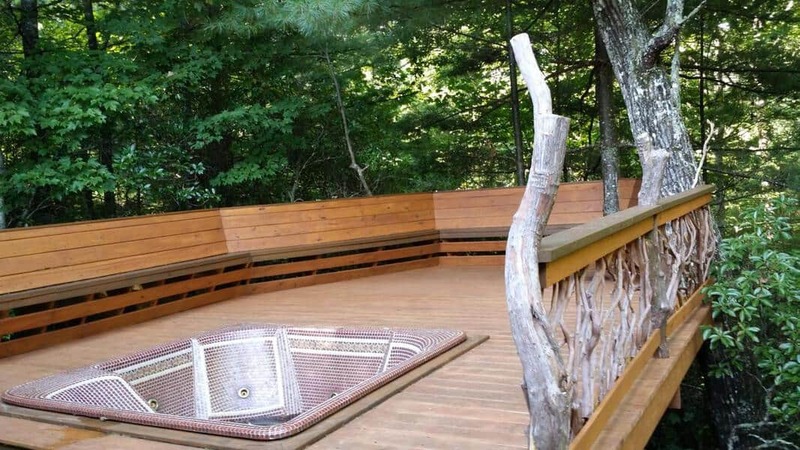 The additional feature of the hot tub is of course the center-piece of the entire deck. Both in color, dimensions, shape and even style, the hot tub enjoys a somewhat symbiotic relationship with the entire deck and bench design, as they all complement each other. 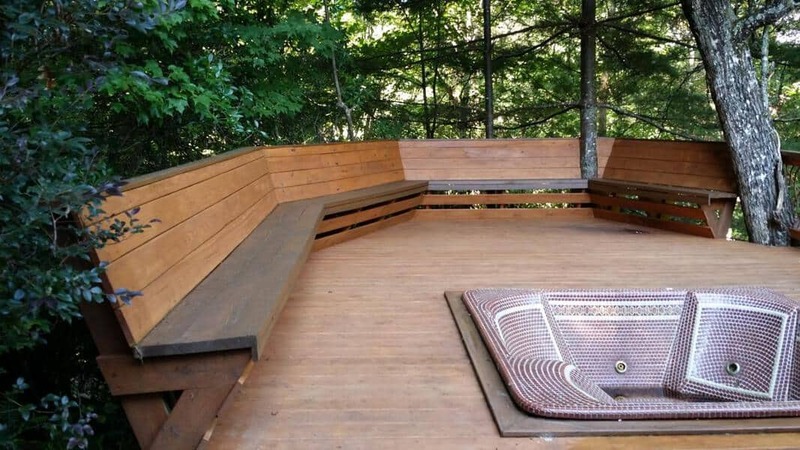 Providing an unusual element in the usual outdoor deck design, the hot tub also serves the artistic function of being a unifying element to the rest of the deck. Features such as the railing, the bench railing, and even the flooring basically take form and position in reference to the tub. It is also noteworthy to consider that this is a fully functional hot tub that can provide real and practical use as a bath tub, especially in the right weather. All in all, the branch railing, bench and hot tub deck design provides a host of benefits in an ingenious and beautiful manner. Great use was made of both the space utilized for the deck, and the surrounding landscape. The finished work is a statement of great outdoor style, while simultaneously serving as a functional outdoor recreational location for social activities, such as mini-parties, or just a quiet drink or get-together with friends and family.